If you were in the ocean and were drowning, would you want someone to try to teach you to swim at that moment, or would you just want to be brought in, to safety? More than likely, you would be in “survival mode” and you want to be saved. Even if a person tried to teach you to swim, you would not be able to learn. When humans or animals are in “survival mode”, it is nearly impossible to learn a skill. When the brain perceives a situation as “life or death”, it completely focuses on surviving and cannot focus on learning new skills. 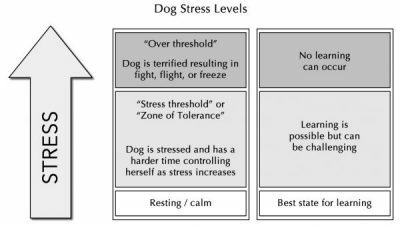 When an animal is fearful or anxious, their brain also has a hard time focusing on learning new skills. When animals are afraid, they will go into “fight, flight or freeze” (as do humans). A dog may go into “fight” mode when he sees another dog or person on a walk. The dog may bark, growl and lunge at the other dog or person. When the dog is barking, growling and lunging, he is not capable of learning a new behavior, he may not even be able to respond to any trained cues. These dogs need to be “saved” from the situation, then taught how to respond in a better way when they are not stressed. If a dog is scared at the veterinary office, she may “freeze” in the exam room. If this occurs, she may not respond to any cued behaviors and she definitely would not be able to learn any new behaviors. Many people who have horses experienced this problem over the last 2 years in Southern California (where I live). Within the last 2 years, we have had multiple wild fires. Horse property was greatly affected by the fires and many people had trouble getting their fearful horses into trailers. The horses that were comfortable getting in and out of trailers had little problems, however many horses who were not accustomed to loading into a trailer, refused to get in. These horses were in “flight”, and because they had not learned how to get into a trailer when things were calm, they were too terrified to get in when the fire was approaching. The next time your pet is clearly stressed, anxious or afraid, do not try to teach them in that moment. Instead, get them to safety and once they are calm, you can take the time to teach them the skills they need to stay calm. As humans, we practice “emergency protocols” for fires, earthquakes, hurricanes, etc. because we want to be prepared for situations that will be stressful. Why not do the same thing for your pets?